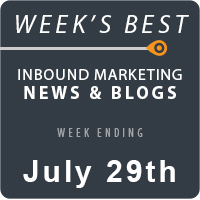 This week’s roundup includes tips to optimize your website for Google Mobile-First Index, boost Email newsletter subscriptions, and convert website visitors into valuable leads. Learn how to create an active Pinterest presence, and avoid minor SEO mistakes that can have a negative impact on your business. We’ve covered all of this news and, much more, below! Learn how to make your Content popular by leveraging your expertise and network, and ensuring that your Content is trendy, from Neil Patel’s blog. Jessica Mehring emphasizes the need to have a goal, and create Content in formats that can engage your audience in the best possible way as a part of your Content Marketing plan. Stefanie Flaxman offers useful tips to help Content Marketers edit their blogs, and produce positive results. Heidi Cohen discusses how Content Marketing tactics such as creating quality Content, and tracking ROI can help marketers stay ahead in the competition. Alyce Vayle’s blog highlights the importance of a Content strategy and offers guidance to create a Content strategy. Learn how to set up a modern sales funnel easily to generate leads from Jonathan Gebauer’s blog. Paul Rouke presents the expected trends for Conversion Optimization in the year 2017, to help marketers enhance their Conversion Optimization efforts. Rikke Thomsen offers guidance to convert website visitors into valuable leads. Lisa Marcyes discusses strategies that can help marketers generate leads using Social Media. Monica Montesa offers valuable Email content tips to write engaging and effective Emails. Chad White discusses the Email Marketing trends expected in the year 2017, to help marketers streamline their Email Marketing campaigns. Learn how behavioral targeting can help brands personalize their communication with consumers, and improve the effectiveness of Email campaigns from Lisa Mayer’s blog. Meghan Durett presents tried and tested methods to boost Email newsletter subscriptions. Govind Agarwal highlights the SEO aspects that must be considered from the Mobile standpoint in the year 2017. Learn how to optimize your website for Google Mobile-First Index from Alan McCabe’s blog. Sean Si offers guidance to avoid minor SEO mistakes that can have a negative impact on your business. Daniel Butler discusses the SEO challenges that marketers must deal with in the year 2017. Learn how user engagement would impact SEO after Google’s latest Penguin update, Penguin 4.0 from Nick Rojas’s blog. Follow the valuable tips from Karen Taylor to boost your SEO efforts in the year 2017. Kimberly Crossland highlights how strategies such as coming up with a content plan, and telling your customer’s story can help you rank for Organic searches. Learn how to create a vibrant and active Pinterest presence from Paul Cook’s blog. Follow the tips from John Nemo to gain the trust of prospective clients and customers using your LinkedIn profile photo. Kyle Harper presents ways to optimize Facebook videos to help marketers promote their brands. Disha Dinesh offers helpful tips to enable link building using Social platforms. Viveka von Rosen offers guidance to navigate the new LinkedIn interface and find what you need.